Have you ever tried pear juice? What did you think? I was curious to find out more about pear juice benefits so I did a search online. I quickly realised there was precious little research out there. It seems that since pear juice is not heavily produced on a commercial level, studies about the potential impact are few and far between. Due to the lack of information about the effects of pear juice, I decided to break it down into its individual components to figure out the answer. Thank goodness the nutritional composition of pear juice is fairly well documented – even if its effect as a whole is not. Read on to find out my discoveries. Like all well-loved fruits and veggies, there are are many more varieties of pear out there than those we’ve probably tasted. They’re grown on a tree or shrub and not all varieties are edible. 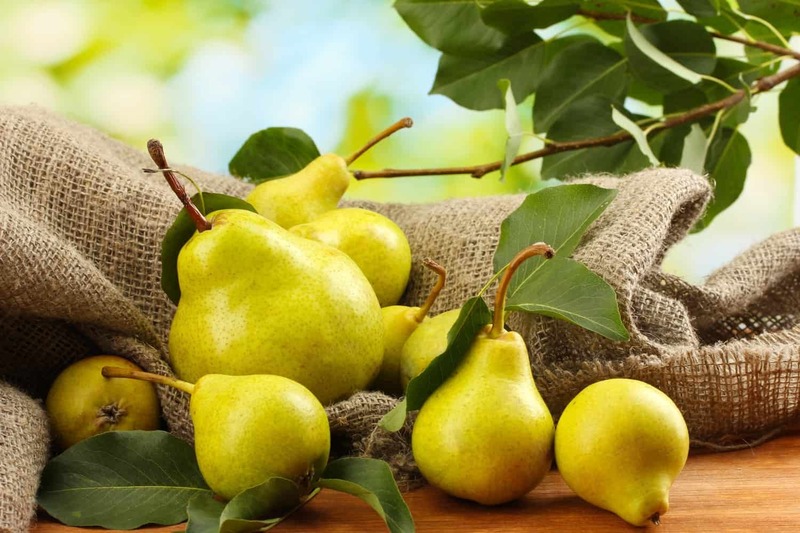 Pears are native to Western Europe and North Africa, but nowadays China is the worldwide largest producer of pears. Washington holds the supreme pear-growing state title in the United States. Pears don’t necessarily top the list when you think of superfoods. As it turns out, they are chock full of vitamins, minerals and phytonutrients that provide amazing benefits for our bodies. What impressed me most is the breakdown of antioxidants in pear juice. It packs quite a punch. Let’s take a closer look at how pear juice can help our bodies stay hale and hearty. Potassium is a mineral crucial in many bodily functions. It assists in building proteins and muscle tissue, helps your body use carbs, helps kids grow normally, controls electrical activity in the heart, and keeps the acid-base balance on track. It is number three in line when it comes to levels of minerals in the body. Potassium supports heart health. It aids in brain health and can help fight stroke. It helps regulate blood sugar. Potassium is crucial in the function of our muscles. In fact, our muscles would have a hard time moving without it. Potassium also maintains the balance of water in our bodies. People with certain diseases, like kidney disease, are discouraged from eating diets rich in potassium. Doctors will typically outline a low potassium diet to help people with kidney disease stay well. Vitamin C serves as an antioxidant and is involved in many body processes. It is a water soluble vitamin, meaning the body cannot store it and we must frequently take in more, especially since the body cannot create its own. Vitamin C is somehow involved in almost every function of the body. It helps eliminate free radicals, or toxins from our environment that damage our bodies. Vitamin C is also crucial to the development of collagen, which is an important protein in maintaining the structure of our tissues. Consuming dietary fiber not only helps with bowel movement regularity, it can also help prevent heart disease and lower your risk of developing diabetes. 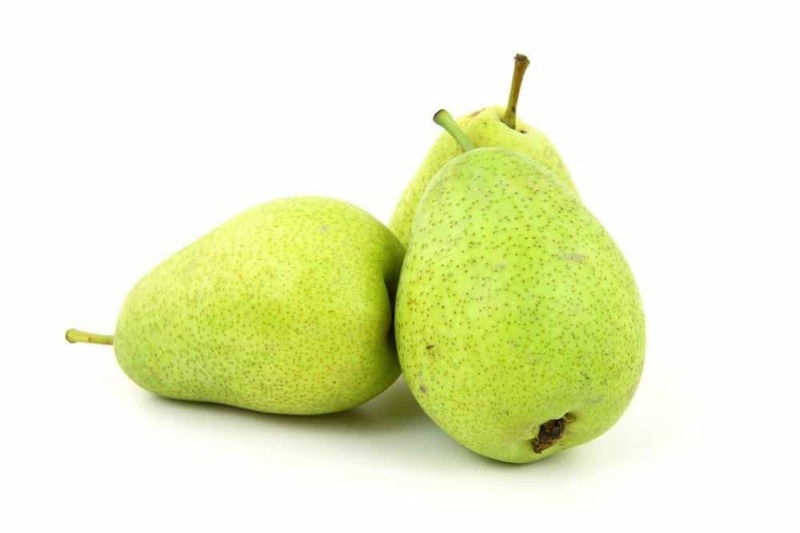 Pears have both kinds of fiber: soluble and insoluble. 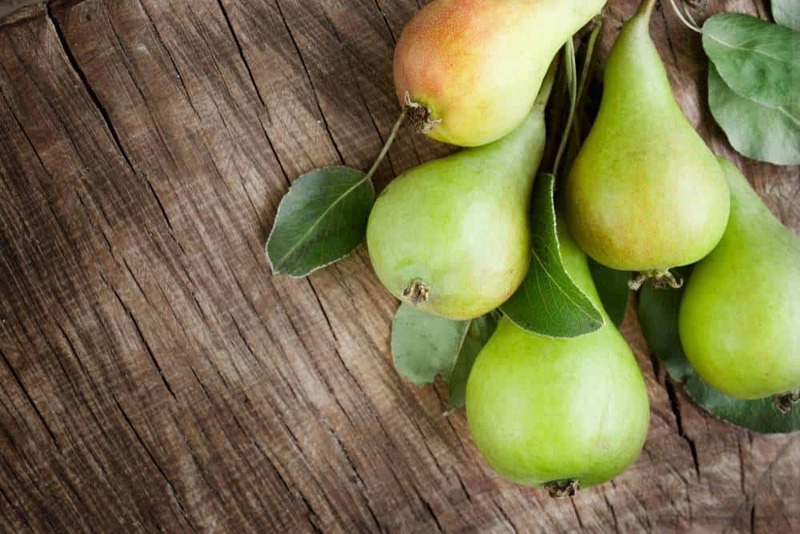 This makes pears an exceptionally well-rounded source of fiber. Soluble fiber dissolves in water to form a sort of gel. The fiber gel helps lower cholesterol and blood sugar levels. Insoluble fiber is the type of fiber that helps keep your digestive system moving. A healthy, active digestive system is almost certain to help you feel better and stay healthier. Many studies have found that flavanols have properties that promote a healthy heart. A study conducted found that flavanols helped reduce the blood vessel restriction found in tobacco smokers. Another study concluded that their positive impact on blood flow helps maintain healthy brain function. This antioxidant compound is found in the highest concentrations in green tea, but it is also present in smaller amounts in pears and pear juice. Though evidence isn’t conclusive, catechin may help reduce incidences of cancer when consumed in great enough amounts. This phytonutrient, best known for its presence in cocoa, has possibly been linked with the ability to help fight diabetes. Epicatechin has also shown to have potential heart health benefits. As is the case with many antioxidants, its ability to battle free radicals mean it helps with a multitude of health issues. Though the name is VERY similar, flavonols and flavanols are different substances. Flavonols have been shown to inhibit histamine reaction (which cause allergy symptoms). Studies also show that flavonols may help lower LDL (bad) cholesterol, which contributes to heart health. This compound is thought to help reduce the risk of diabetes complications, improve heart health, and act as an anti-cancer agent. Quercetin is good for prostate health, with studies showing that consuming it reduces pain and swelling of the prostate. It is also thought to improve cardiovascular function. The effects of kaempherol have been more widely studied the rest of the phytonutrients in pears. Studies have shown kaempherol consumption to be linked with decreased risk of cancer and heart disease. It has been proven to have anti-inflammatory properties. Found in red pears, this flavonoid class contains a lot of antioxidants. They help reduce inflammation and therefore increase blood circulation. Their antioxidant properties may also help prevent such diseases as cancer and heart disease. Beta carotene is a member of the carotenoid family. Carotenoids are an important compound in helping our bodies fight free radicals. They are thought to fight cancer, curb inflammation, and support the immune system. Some carotenoids are converted by the body to vitamin A, which aids in the healthy development of tissues, namely in the eyes. Beta carotene has been proven effective in reducing the risk of sunburn and reducing sun sensitivity. It has also been used to treat eye diseases, breathing issues, pregnancy complications, and certain complications that arise after giving birth. It is shown to reduce the risk of some cancers, as well. Lutein is another carotenoid, most notably effective in its treatment of vision problems. It can help fight vision loss, lower the risk of developing cataracts, reduce eye fatigue, and promote good vision. This phytonutrient also helps to potentially promote a healthy brain and improve memory. Zeaxanthin is also thought to promote good eyesight and general eye health. It is often taken in conjunction with lutein since they work great as a team. Some studies show that people with diets high in zeaxanthin and lutein are 50% less likely to develop cataracts. Chlorogenic acid is most notably found in green coffee beans. Those can be hard to stomach, so the it is also present in pear juice. Though research is lacking thus far, preliminary findings state that chlorogenic acid may reduce blood sugar levels and help you lose weight. Syringic acid has been found to aid in the healing of liver injuries. It is also said to help regulate blood sugar levels. Though not one of the more lauded antioxidants, this phytonutrient can help your body in big ways. Vanillic acid works with syringic acid in the healing of liver injuries. Its efficacy in gene therapy is also being explored. The medicinal uses of vanillic acid are rather far reaching, including inhibiting snake venom and reducing inflammation. These types of acids are often thought of as super antioxidants. Their chemical makeup means they are fantastic and hunting down free radicals. Coumaric acid has been shown in studies to promote gut health by activating microbial functions that are important to maintaining a healthy digestive system. Antioxidants fight free radicals and environmental toxins that may contribute to many diseases, not to mention aging. By eliminating these free radicals, the antioxidants help your body’s cells stay healthy. Different antioxidants serve different purposes. The vitamins and antioxidants in pear juice may help reduce inflammation in the body. Despite the fact that inflammation is a necessary and even helpful function of your immune system, high levels of inflammation can cause damage to tissues and organs. The antioxidants in pears, along with vitamin C and fiber, make them ideal for combating heart disease. The anti-inflammatory effects of many of the phytonutrients in pears have been proven effective in helping lower the risk of heart disease by lowering cholesterol, blood pressure, and improving circulation. With all the powerful antioxidants present in pears, their ability to curb cellular mutation is well documented. Consuming pears and pear juice on a regular basis, along with other fruits and veggies full of good phytonutrients is thought to reduce cancer risk. It’s near impossible to find pear juice in the supermarket, unless it’s a small component of a mixed fruit juice. Chances are you’ll have to make it at home. The good news is that DIY pear juice retains many more nutrients than commercial juices. And you avoid nasty preservatives and additives too. Here are some simple ways to make sure your pears hold on to as much of their nutritional value as possible when juicing pears at home. You may have heard that the skins of fruits and veggies contain the highest nutrient content. This is very true when it comes to pears. 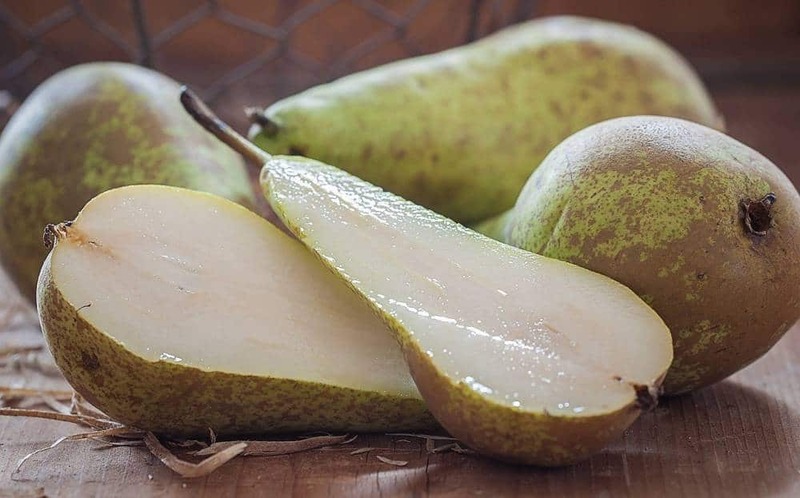 Make sure you leave the skins on your pears before juicing them at home, and check to see if the fruits are juiced with the skins on if you’re buying premade pear juice. 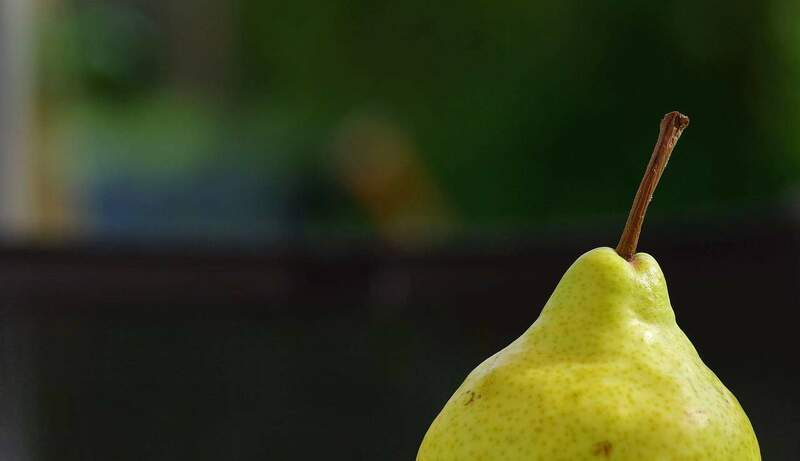 Since the fiber combination in pears is so beneficial, allowing some of the pulp into your pear juice can go a long way towards making your pear juice just as healthy as the whole fruit. Aside from the added health benefits, it will provide your juice with a very unique texture. Personally, I prefer it this way, but it’s not for everyone. For fruits and veggies, a juicer that extracts juice at a low temperature is ideal to maintain nutritional value. The reason for this is that heat degrades many components and completely deactivates enzymes. This Omega juicer model is a great, heat-free choice. When the pulp is entirely removed from pear juice, a drastic reduction is seen in the amount of antioxidant compounds. If you can’t stomach the pulp in your juice, you can get the same pulpy pear juice benefits by just saving some of the pulp and eating it. Try making a fruit sauce with it or a healthier alternative to jam. Pear juice is rather high in sugar. 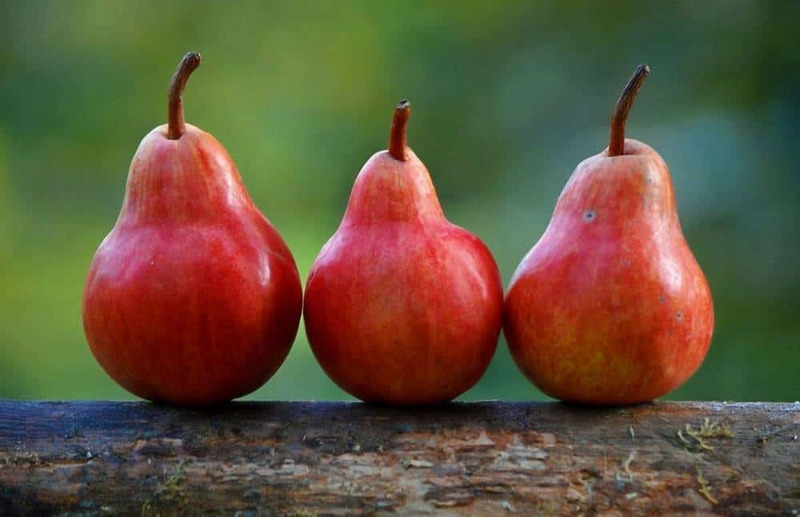 Pears are, in fact, one of the fruits with the highest sugar content per serving. High sugar intakes can lead to a multitude of ailments, so drink pear juice and all fruit juices in moderation. Overall, they are a healthy addition to most any diet. As you’ve read here, pear juice contains many beneficial phytonutrients. 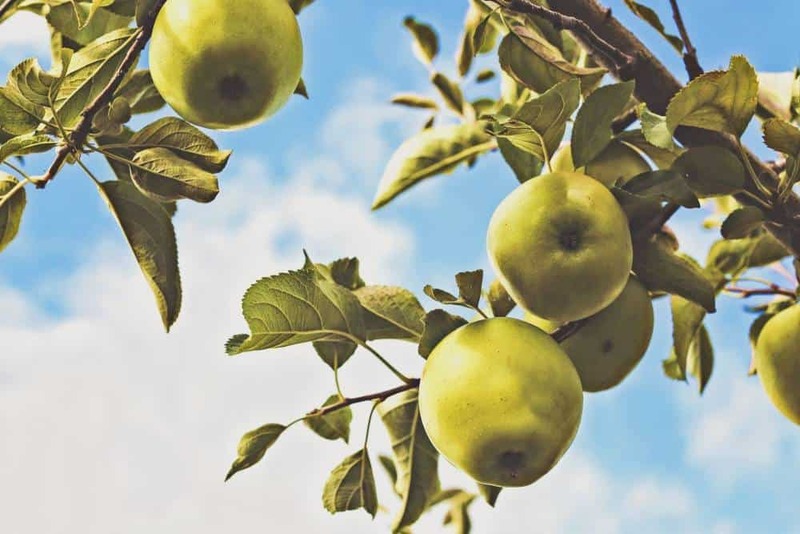 While the health effects of pear juice haven’t been studied as in-depth as more popularly consumed commercial juices like orange, we’ve figured out what many of the compounds in pear juice can do for our bodies. 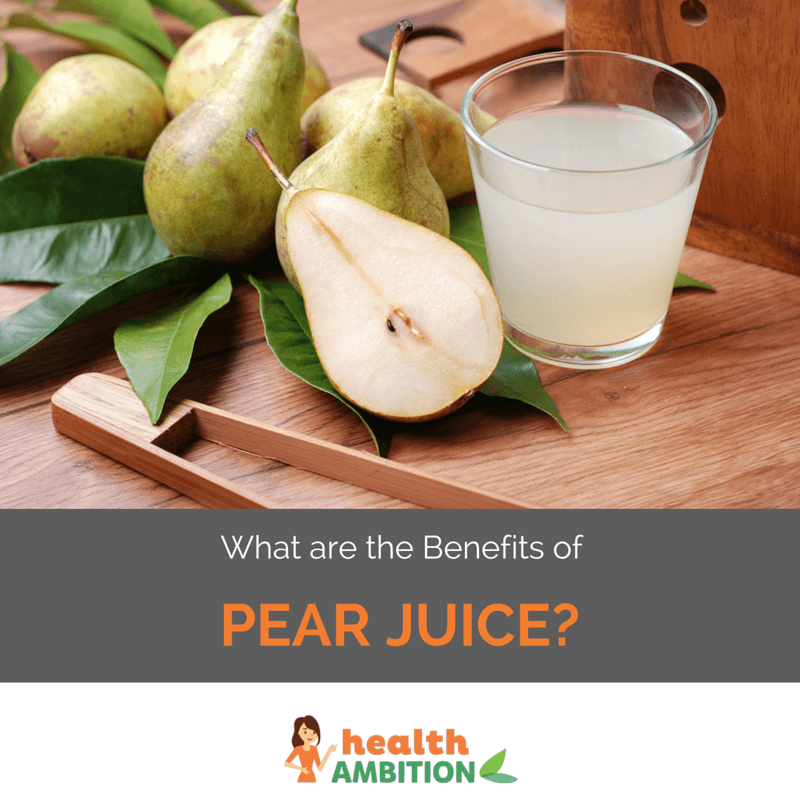 There are many health benefits when it comes to pear juice. Lower risks of cancer, type 2 diabetes, and heart disease may all be associated with drinking pear juice. Use the best practices, like using a high quality cool juicer like this one to get the most from your pear juice. What Are The Best Juicing Recipes for Anxiety? What Are the Benefits of Amla Juice? What are the Benefits of Sugar Cane Juice?